Colonies of P. antarctica strain CCMP 1871. Phaeocystis is an important unicellular, photosynthetic, eukaryotic algae distributed throughout the world's oceans. Representative of this genus live in the open ocean as well as in sea ice. 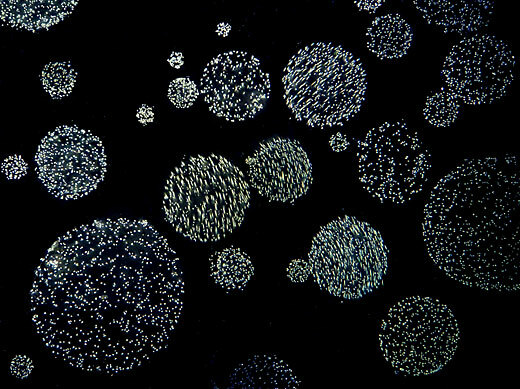 A unique attribute of Phaeocystis is its ability to form a floating colony with hundreds of cells embedded in a polysaccharide gel matrix that can multiply massively during blooms. In a collaborative effort between Stanford University, The Carnegie Institution and the Joint Genome Institute, we are working to sequence and annotate the Phaeocystis antarctica genome. This polar alga plays a major role in global carbon and sulfur cycles. It sequesters CO2 efficiently over large geographical areas during blooms and is a major emitter of 3-dimethylsulphoniopropionate (DMSP), the precursor of dimethyl sulfide (DMS). Biogenic DMS contributes about 1.5x1013 g sulfur to the atmosphere annually and plays a major part in the global sulfur cycle, in cloud formation, and potentially in climate regulation. Although investigated intensively for decades in cultures and in the field, important questions with respect to its life cycle and growth regime remain unanswered. Sequencing of the P. antarctica genome will provide long-awaited insights into processes that enables it to form massive blooms, to transition from solitary to colonial stages, and to transition from the water column to sea ice. Ultimately, a better understanding of the metabolic pathways present in this enigmatic organism may aid in forecasting its future distribution as global warming continues and ice cover diminishes in the Southern Ocean ecosystem.